Phase IV is the only feature film directed by Saul Bass, the ingenious credit sequence specialist and it really is a truly remarkable, almost alien piece of work. The story begins in space, a shot of the sun emanating a solar flare. The narrator tells us that the effect on earth, while some predicted annihilation, was almost imperceptible. The sole alteration in the nature of the universe is that ants seem to have picked up a signal from the flare, something that shifts them up the evolutionary scale, something that gives them purpose, a desire to dominate the planet. At first they concentrate on eliminating their nearest threat: spiders, mice, lizards. Later, they direct their sole attention to the next most advanced creatures on the planet: us. The phases referred to in the film indicate the stages of evolution the ants go through to assert their dominance over mankind. 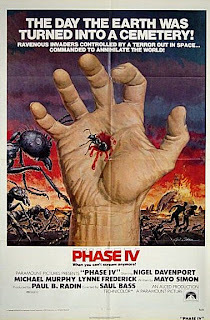 This may all sound like a 50's B-movie, and it may very well take its cue from such pulp, but Phase IV is a uniquely composed masterpiece of surreal science-fiction. Set in the bleached vistas of the Arizona desert, Saul Bass delivers effectively the feeling of an awakened terrestrial intelligence that seems to have merely been lying in wait for us. The tactical battle that ensues between the research station and its two scientists (the crazed Englishman, Hobbs, and the cool Californian Games Theorist, Jim) is enthralling. Bass simply tweaks the dial of the way things are to create an apocalypse in microcosm, the natural extension of which is clearly sinister, dystopian. The ants build reflective sand-towers to overheat the station. Jim desperately tries to communicate with the ants using geometrical symbols (“It's the only universal language between intelligent creatures, goddamit!”). In a particularly unnerving scene, the ants send back a circle with a dot in the middle, representing the research station and the girl whom they plan to abduct. The girl (Kendra) is played by the stunningly beautiful Lynne Frederick, rescued from a nearby farm. Strangely, Kendra is not her real name, but the name of her horse, who was killed by the ants. It is never made clear why she adopts this name, but it is somehow tragically resonant. We didn't know why…but we knew we would be told. So, we can hypothesise that Kendra and Jim are to assimilate the rest of humanity, that a new symbiotic intelligence has been created by the solar flare, effectively destroying mankind, forever altering the history of the planet. The perfect organization, resilience, and communal power of the ants is deified within the film, and the thematic and spiritual anxieties seem to dissipate with the emergence of Kendra and Jim, human of form but with a new, selfless desire to progress for the good of the colony. The film, as you might expect from the visually inventive Bass, is beautifully put together. The ants themselves are wonderfully captured on screen. Believe it or not, there are several amazingly emotive scenes from the insects. Bass has constructed the story around them so effectively that their obviously natural actions take on greater significance. The desert shots highlight the sparse oddity of our own landscape, showing that this planet is as alien to us as any beyond the stars. There are segments of the film which feel like an art installation, they are so perfectly formed and individually defining. In particular, the scene where Kendra, Jim and the central ant intelligence merge, is a magical expressionistic collage of abstract images, reflections, cross-fades, and superimpositions. The only film that comes anywhere near this in terms of communicating effectively the dread and wonder of an alien presence is Event Horizon (another drastically underrated film). Phase IV is a rare film that certainly approaches the medium from another direction. It offers a glimpse at something truly threatening, fully expressing the shallow, inessential position that humanity occupies in the universal order. Part science-fiction, part-horror, the film always makes me feel unsafe, detached. Saul Bass, at the first attempt, created an incredible, powerful film. Funnily enough, there are no credit sequences. with a whole load of genius ants.